even if it is just a Palm Warbler in the Mud. 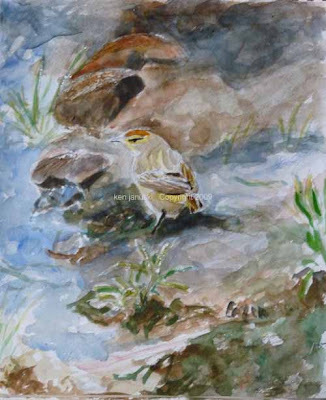 A quick watercolor based on a photo of a palm warbler seen at Oakdale Nature Preserve in Freeport, Illinois in April, 2008, in fairly wintry conditions. We will forget about all I've said regarding values and tonal contrast for this one............... I remained somewhat true to the muddy conditions of the warbler's habitat. And though I thought of tonal variety as I worked it just seemed to disappear. I think the white paper, peeking through in places, counteracts the mud somewhat. I may do more work on this but most likely I'll just leave it as is. I fear more work will only make it darker and muddier. The palm warbler truly is a sign of spring in our area though. Pine warblers are often earlier but less likely to be seen. But when you see the golden glow of the palm you know that spring is on its way! The title is not mine, but a direct quote from "Watercolors of Winslow Homer: The Color of Light" by Martha Tedeschi, et al., from a show at the Art Institute of Chicago. In my last post I mentioned 'reveling in materials' as a motivation of myself and I think of many artists. You can say all you want about artists thoughts and writings, even my own thoughts and writings, but often it comes down to something much more simple: a great enjoyment in experimenting with the materials of art. My guess is that the same can be said for music. One can find here a metaphor for Homer's sustained relationship with watercolor itself. It was in this medium that the artist had conveyed his most immediate expressions and experiences while also clearly reveling in the beautiful effects that it alone allowed him to pursue. Over three decades of focused work and travel he had discovered the bewitching secrets of watercolor's unique marriage of color, water and light. Homer was the master of 'reveling in the beautiful effects' of watercolor while at the same time being true to light, water, subject. It would be hard to find a better example for someone who wants to work in watercolor. I worked some more on the watercolor from last week. I was happy with what I had accomplished but it seemed like just a good beginning. Most of what I needed to change had to do with more 'formal' considerations: value, color, variety in both. 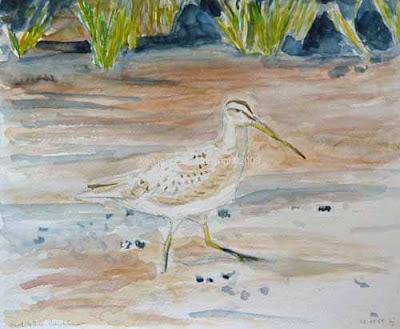 I was satisfied with the more naturalistic concerns: does it look like the dowitcher? As I worked on it today I realized that I was finally getting close to what I'd like to accomplish in my naturalistic art: honest portrayal of what I've seen but also the sensual and formal pleasure of making art. Since graduate school or earlier I've had arguments about this with teachers and fellow artists. Artists are a varied bunch and make their art for various reasons. I've always ended up in the formalist camp not the deep personal expression camp, the political camp or any other camp. Formalism can seem like a hard, lifeless reason for making art. But while working today I realized that for me it really is closer to sensualism: reveling in the materials that I use and what they can accomplish visually. Matisse was a great formalist. He said: "Then a moment comes when every part has found its definite relationship and from then on it would be impossible for me to add a stroke to my picture without having to paint it all over again." Every shape, color and brush mark in his art had a purpose. This is my type of art: color, brushwork, value, tactility all combine to make a sensuous and beautiful object. In taking up naturalistic art about three years ago I needed to subordinate this tendency to that of learning how to portray birds so that they actually looked like what I saw. It's been a slow but rewarding process and there is still a huge distance to go. But today for the first time I felt that I was actually able to combine some of that desire to portray what I saw with my somewhat sublimated desire to use color, shape, lines, brushwork in the sensuous way that I used to do in my abstract work. I've taken liberties with both color and value. They didn't look quite this way. But I do think that they make for a better painting. That is my goal: portray what I see, but do so with artistic freedom. For me that is what makes artmaking enjoyable, and I've always thought that what is enjoyable or at least truly felt to the artist, eventually comes through to the receptive viewer. That is all any artist can hope for. The beautiful watercolors of Lars Jonsson and an uncooperative Ruby-crowned Kinglet, both mentioned yesterday, conspired together to get me to start a new watercolor today. The kinglet made another brief appearance but did so while I was busy with something else so I couldn't draw him. Rather than sit staring out the window waiting for him or other birds to appear at the feeder so I could work from life I decided to go back to working from photos. I looked again at the Jonsson book yesterday and I think that pushed me towards watercolor for my new work. They are inspirational! 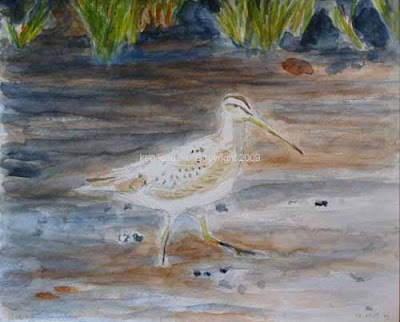 This is the same dowitcher that appears in an earlier post as a charcoal drawing. In that post I said that it also might appear in a watercolor so here's the fulfillment of that 6 month old prediction. I'll probably do more work on this but I'm stopping for today. For now it's just great to be working again.